The European (EU) genotype of porcine reproductive and respiratory syndrome virus (Genotype-I PRRSV) has recently emerged in China. The coexistence of Genotype-I and -II PRRSV strains could cause seriously affect PRRSV diagnosis and management. Current vaccines are not able to protect against PRRSV infection completely and have inherent drawbacks. Thus, genetically engineered vaccines, including DNA vaccine and live vector engineered vaccines, have been developed. This study aimed to determine the enhanced immune responses of mice inoculated with a DNA vaccine coexpressing GP3 and GP5 of a Genotype-I PRRSV. To evaluate the immunogenicity of GP3 and GP5 proteins from European-type PRRSV, three DNA vaccines, pVAX1-EU-ORF3-ORF5, pVAX1-EU-ORF3 and pVAX1-EU-ORF5, were constructed, which were based on a Genotype-I LV strain (GenBank ID: M96262). BALB/c mice were immunized with the DNA vaccines; delivered in the form of chitosan-DNA nanoparticles. To increase the efficiency of the vaccine, Quil A (Quillaja) was used as an adjuvant. GP3 and GP5-specific antibodies, neutralizing antibodies and cytokines (IL-2, IL-4, IL-10 and IFN gamma) from the immunized mice sera, and other immune parameters, were examined, including T-cell proliferation responses and subgroups of spleen T-lymphocytes. The results showed that ORF3 and ORF5 proteins of Genotype-I PRRSV induced GP3 and GP5-specific antibodies that could neutralize the virus. The levels of Cytokines IL-2, IL-4, IL-10, and IFN–γ of the experimental groups were significantly higher than those of control groups after booster vaccination (P < 0.05). The production of CD3+CD4+ and CD3+CD8+ T lymphocyte was also induced. T lymphocyte proliferation assays showed that the PRRSV LV strain virus could stimulate the proliferation of T lymphocytes in mice in the experimental group. Using Quil A as adjuvant, Genotype-I PRRSV GP3 and GP5 proteins produced good immunogenicity and reactivity. More importantly, better PRRSV-specific neutralizing antibody titers and cell-mediated immune responses were observed in mice immunized with the DNA vaccine co-expressing GP3 and GP5 proteins than in mice immunized with a DNA vaccine expressing either protein singly. The results of this study demonstrated that co-immunization with GP3 and GP5 produced a better immune response in mice. Porcine reproductive and respiratory syndrome (also known as “blue ear disease”) is a highly contagious disease of pigs caused by porcine reproductive and respiratory syndrome virus (PRRSV). The disease causes reproductive failure in pregnant sows; in particular it causes a respiratory disease characterized by reproductive failure (late miscarriage, stillbirth, mummified, weak or tired piglets) in pregnant sows . According to its antigenic differences, PRRSV can be divided into two subgroups: The European-type subgroup A (Genotype-I) reported by Wensvoort in 1991; the European representative strain is the LV strain ; and the North American-type Subgroup B (Genotype-II) reported by Benfield in 1992; the U.S. representative strain is VR-2332 . The nucleotide sequence similarity of the two subgroups ranges from 54% to 67%. In the past, the predominant strains in Europe were subgroup A, while in the United States and the Asia-Pacific region, B subgroups predominated. Genetic analysis of Chinese PRRSV isolates showed that the main subgroup is the North American type. Recently, however, PRRSV has broken its geographical constraints. Genotype-I PRRSV has been reported in Asia and North America, and American wild-type PRRSV has been isolated in Europe [4, 5]. The coexistence of Genotype-I and -II PRRSV strains could cause problems for PRRSV diagnosis and management. In recent years, several European type PRRSV field isolates were reported in Asian countries, such as South Korea and Thailand. Genotype-I PRRSV was also reported in China. Various research groups have isolated Genotype-I PRRSV in China [6–8]. Importantly, the appearance of European type PRRSV in China presented a significant challenge to the prevention and control of PRRSV, increasing the difficulty of analyzing the highly pathogenic PRRSV and the molecular mechanisms of immunization. PRRSV has a single-stranded, positive strand, non-segmented RNA genome of about 15.0 kb. It contains nine open reading frames (ORFs), and adjacent ORFs partially overlap. ORF3 of PRRSV encodes the GP3 protein, which shows approximately 54% to 60% amino acid identity between North American and European isolates. In addition, GP3 can accommodate cysteine mutations and influence the reproductive capacity of PRRSV . Experiments using a specific monoclonal antibody against the GP3 protein of the LV strain suggested that the GP3 protein is inserted into the virus particle or is a virus envelope-associated protein . The GP3 protein plays an important role in viral infectivity and may induce cellular immunity. GP5 is a glycosylated protein, known as the E protein. GP5 has six epitopes that can induce specific neutralizing antibodies. The neutralizing ability of the antibodies is stronger than those induced by GP4 [2, 9, 11]. Pigs infected with PRRSV generate a series of anti-PRRSV specific antibodies; however, these antibodies cannot completely remove PRRSV and the immune response is slow. PRRSV interferes with induction of the cellular innate immune response, which is closely linked with apoptosis. These may explain the slow porcine immune response; however, the mechanism of this interference remains unclear . Viral epitopes that could induce neutralizing antibodies are located in the M, GP3 and GP5 proteins. Epitopes that can induce antibody-dependent enhancement (ADE)-mediated effects are located in protein N and GP5 . Currently, there are two types of commercial vaccines for PRRSV: modified live-attenuated vaccines (MLVs) and killed vaccines. However, both of them have inherent drawbacks. Killed vaccines are weakly immunogenic and cannot always provide protective immunity against PRRSV infection . Although MLVs can provide a certain degree of protection against PRRSV, there is a possibility that the attenuated virus could return to high virulence . Thus, there is an urgent need to develop more effective vaccines against PRRSV. DNA vaccines are a new generation of safe vaccines, and immunization with DNA vaccines elicit both cell-mediated and humoral immune responses [15–17]. Vaccines require optimal adjuvants, including immunopotentiator and delivery systems, to offer long term protection from infectious diseases in animals. Chitosan has well-defined properties including bioavailability, biocompatibility, low cost and an ability to open intracellular tight junction [18, 19]. Therefore, chitosan, combined with advances in nanotechnology, can be effectively applied as a carrier system for vaccine delivery. Quillaja (Quil A) is a promising adjuvant that has been used in numerous prophylactic and therapeutic vaccines. Quil A modulates the cell mediated immune system as well as enhancing antibody production. In addition, only a low dose is needed for its adjuvant activity [20, 21]. In this study, DNA vaccines pVAX1-EU-ORF3-ORF5, pVAX1-EU-ORF3 and pVAX1-EU-ORF5 were constructed based on the European LV strain (M96262) and formulated together with chitosan. Quil A was used as an adjuvant to immunize mice with individual DNA vaccines and their immunogenicities were evaluated using animal experiments. The recombinant proteins expressed from pET-28a-ORF3 and pGEX-4 T-ORF5 were recovered separately and subjected to SDS-PAGE (Figure 1). pGEX-4 T-ORF5 expressed a protein of 42 kDa and pET-28a-ORF3 expressed a protein of 35 kDa, both of the expected size. European type PRRSV GP5/GP3 prokaryotic protein expression and purification. (A) Protein expressed from pGEX-4 T-ORF5: M, molecular weight markers; lane 1 and 2, GP5 protein after IPTG induction; lane 3 and 4, empty vector control before IPTG induction; lane 5 and 6, purified protein. (B) Protein expressed from pET-28a-ORF3: M, molecular weight markers; lane 1 and 2, GP3 protein after IPTG induction; lane 3 and 4, purified protein. To determine whether the viral proteins were expressed from the DNA vaccines or not, BHK-21 cells were transfected with recombinant DNA vaccines pVAX1-EU-GP3-GP5 and recombinant vaccinia viruses rddVTT-GP3-GP5 and their protein amd mRNA expressions were detected by an indirect immunofluorescence assay (IFA) and RT-PCR (Figure 2). The IFA showed that recombinant vaccines transfected or infected into BHK-21 cells could be labeled with PRRSV-specific antibodies (Figure 2A), but cells transfected with pVAX1 control were not labeled, proving that GP3 and GP5 were expressed in vitro. After transfection (72 hours), the GP3 and GP5 mRNA could be detected by RT-PCR (Figure 2B). Identification of expression of foreign proteins in vitro. The expression of GP3 and GP5 of PRRSV were confirmed by an indirect immunofluorescence assay (IFA) following incubation with anti-PRRSV GP3 or GP5 protein antibody in BHK-21 cells (A). RT-PCR was performed to detect expression of the GP3 and GP5 mRNAs (B). In the sera of mice immunized the DNA vaccines expressing GP3 and GP5, specific antibodies could be detected one week after immunization. However, compared with the control group at 7 dpi, the difference was not significant (P > 0.05). The antibody levels continued to rise and showed a statistically significant difference compared with the control group after two weeks (P < 0.05). A slight decrease was observed in the third week. After the booster immunization at 21 days, the antibody levels increased to a peak at 35 days post immunization (dpi). The antibody levels in the pVAX1-EU-ORF3-ORF5 group were slightly higher than in the other two experimental groups; however, the difference was not statistically significant (Figure 3). ELISA assay for GP3 (A) or GP5 (B) specific antibodies in sera from mice immunized with recombinant DNA vaccines. The antibody levels in mice immunized with DNA vaccines were compared with control mice immunized with pVAX1 empty vector or PBS. Serum samples (n = 6) were collected at various time-points. Arrows indicate the time of administration of boost immunizations. Data are shown as the mean ± S.D. Sera from immunized mice were collected and separated weekly to detect PRRSV neutralizing antibody titers from two weeks after immunization. The neutralizing antibody titer in mice immunized with the DNA vaccine co-expressing GP3 and GP5 protein (pVAX1-EU-ORF3-ORF5) was significantly higher (P < 0.05) than that in the groups immunized with pVAX1-EU-ORF5 and pVAX1-EU-ORF3 (P < 0.01), and peaked at 42 dpi (1:21.1) (Table 1). The neutralizing antibody titers of each experimental group were significantly higher than control groups (pVAX1, PBS) (P < 0.05) at 42 dpi; however, the neutralizing antibodies produced by the pVAX1-EU-ORF3 group had only a weak ability to neutralize the virus. Virus-neutralizing (VN) antibody titers in mice after vaccination for different groups. Serum samples (n = 8) were collected at various time-points. PRRSV-specific neutralizing antibodies were detected by a virus neutralizing assay with two-fold serial dilutions. The VN titers were expressed as the reciprocal of the highest serum dilution in which no CPE was observed. The levels of cytokines IL-2 and IFN-γ, the main representative Th1 cytokines, were detected in serum separated from collected blood at 14 dpi and 35 dpi. The levels of IL-2 in the experimental groups (pVAX1-EU-ORF3, pVAX1-EU-ORF5, pVAX1-EU-ORF3-ORF5) were significantly higher than in the control groups (pVAX1, PBS) (P < 0.01) at 14 and 35 dpi; however, no significant difference was observed among the experimental groups (P > 0.05). At 35 dpi, the levels of IFN-γ in the pVAX1-EU-ORF3-ORF5 group were significantly higher than those in any of the other groups (P < 0.05) (Figure 4A and B). These results not only demonstrated that the constructed DNA vaccines could effectively stimulate mice to produce specific Th1 lymphocytes, contributing to the secretion of IL-2 and IFN-γ (and possibly other Th1 cytokines), but also suggested the DNA vaccine could induce a cellular immune response in mice. In addition, the combined antigen group showed a synergistically enhanced immune reaction in terms of secretion of IFN-γ and was superior to either single-antigen DNA vaccine. 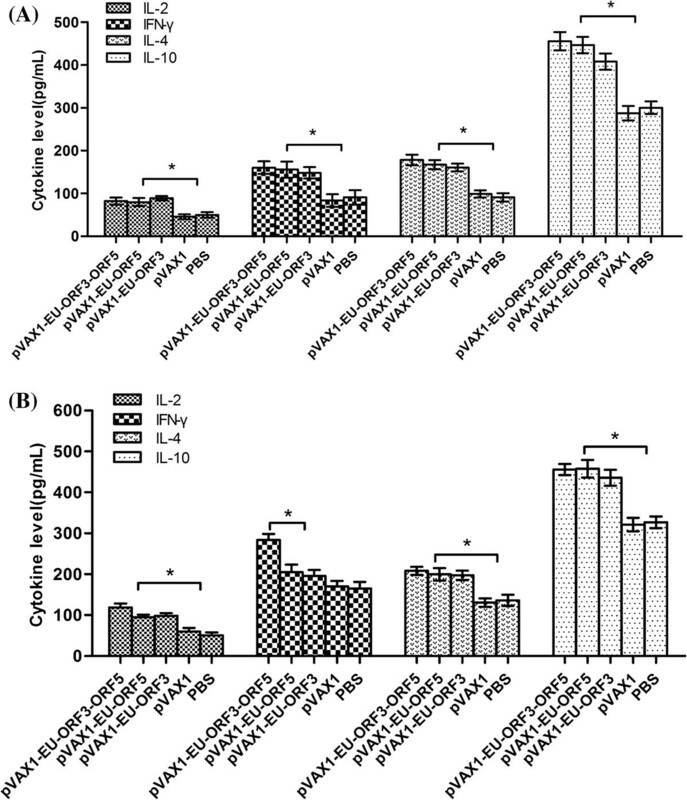 Detection of IL-2, IL-4, IL-10 and IFN-γ secretion levels in immune serum. (A) Cytokine secretion levels in serum at 14 days post immunization (dpi); (B) cytokine secretion levels in serum at 35 dpi. * Indicates a significant (P < 0.05) difference between the groups. Data are shown as the mean ± S.D. The levels of cytokines IL-4 and IL-10, the main representative of Th2 cytokines, were detected in sera at 14 dpi and 35 dpi. The IL-4 and IL-10 levels in the experimental group were significantly higher (P < 0.05) than those in the control groups (pVAX1, PBS) at 14 and 35 dpi; however, no significant difference was observed among the experimental groups (P > 0.05). At 35 dpi, the levels of IL-4 and IL-10 in the pVAX1-EU-ORF3-ORF5 group were slightly, but not statistically significantly, higher than those in the pVAX1-EU-ORF3 group (Figure 4A and B). These results indicated that the DNA vaccine could effectively stimulate the body to increase the secretion of Th2 cytokines related to the humoral immune response. Immunized mice stimulated with the non-specific antigen ConA showed T lymphocyte proliferation, and the stimulation index (SI) was significantly higher than the control groups (pVAX1, PBS) (P < 0.05; data not shown). 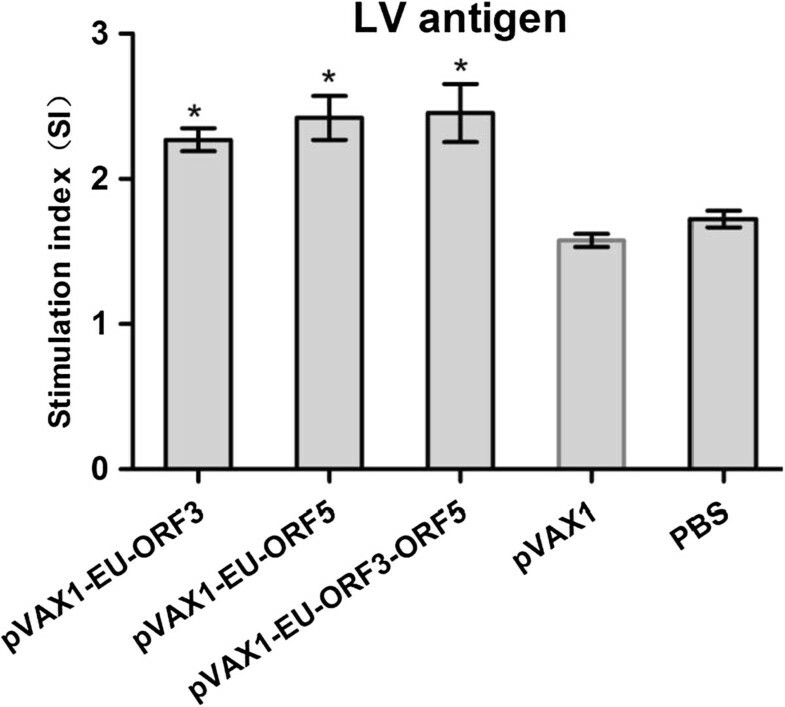 Upon stimulation with the PRRSV LV strain virus antigen, the experimental group produced a specific T lymphocyte proliferative response, and the SI difference was significant compared with the control group (P < 0.05); however, the differences among the experimental groups were not significant (Figure 5). Lymphocyte proliferative responses in immunized mice after in vitro stimulation with purified PRRSV LV antigen. Each group of mice (n = 6) was immunized with 100 μg of DNA vaccine at 0 and 3 weeks. Five weeks after the last inoculation, the mice were sacrificed and their splenocytes stimulated with PRRSV virus. After 72 h of stimulation, WST-1 was added and OD values were determined after a further 4 h of incubation. The samples were assayed in triplicate. Data are presented as the mean ± standard error. * Indicates a significant difference (P < 0.05) between the groups. Data are shown as the mean ± S.D. Two weeks after the second immunization, splenic lymphocytes were isolated and analyzed for CD3+CD4+ and CD3+CD8+ T lymphocytes. As shown in Figure 6, the percentages of CD3+CD4+ and CD3+CD8+ T cells in each experimental group were significantly higher than those in the control groups (pVAX1, PBS) (P < 0.05). 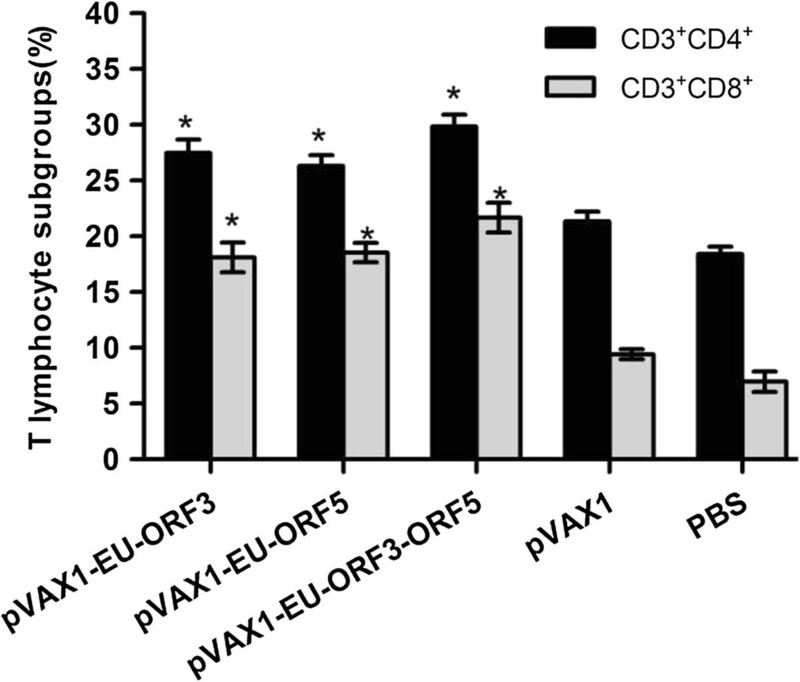 Mice inoculated with pVAX1-EU-ORF3-ORF5 showed slightly higher levels of CD3+CD4+ and CD3+CD8+ T cells than mice inoculated each single antigen. This indicated that DNA vaccines coexpressing ORF3 and ORF5 gene could stimulate murine CD4+ and CD8+ T lymphocyte proliferation, and induce both humoral and cellular immune responses. Detection of T cell subgroups of spleens in mice. Splenocytes of mice (n = 8) were harvested and stained as described in Methods section. FACS was used to analyze the percentage of CD3+CD4+ or CD3+CD8+ T cells. Each bar represents the group mean for the percentage of T cell subgroups. * Indicates a significant difference (P < 0.05) between the groups. Data are shown as the mean ± S.D. PRRSV epidemics have resulted in the virus being spread throughout the world, causing huge economic losses to the pig industry. In the past, European strains of PRRSV were limited to European countries, but have now spread to Asia and North America . South Korea, Thailand, China and other countries have reported many European type PRRSV strains in recent years [23, 24]. European strains Ningbo42 (EF473137) and FJ0603 (EF592535) were isolated and found to be closely related to the Genotype-I PRRSV attenuated vaccine strain AMERVAC-PRRS/A3 . The FJ0602 strain (HM755885) has also been proven to be non-pathogenic to nursery pigs . Two strains of wild-type Genotype-I PRRSV, BJEU06-1 (GU047344) and NMEU09-1 (GU047345), were isolated from a pig compound in 2011 , which was the first report of Genotype-I PRRSV field strains in China. The appearance of Genotype-I PRRSV in China complicates the prevention and control of PRRSV. Genotype-I and -II PRRSV vaccines cannot provide cross-protection, and these two strains may produce recombinant virus, chimeric virus or a new virus, while the selection pressure exerted by antibodies could significantly affect the genetic variation of PRRSV and change its antigenicity [28, 29]. Vaccination is the most effective and valuable tool to prevent infectious diseases. In this study, DNA vaccines based on Genotype-I PRRSV were constructed. The DNA vaccines were formulated together with chitosan and delivered in the form of chitosan-DNA nanoparticles. Chitosan has wide applications in biotechnology, pharmaceuticals, textiles, food, cosmetics and agricultural industries . Research has focused on chitosan’s use as a novel delivery vehicle for drugs, genes, peptides and vaccines, and as a scaffold for targeted delivery and tissue engineering applications [31–33]. Chitosan effectively binds DNA via electrostatic interactions and protects it from nuclease degradation , which enhances transfection efficiency both in vitro and in vivo. To increase the efficiency of the vaccine, Quil A (Quillaja) was used as an adjuvant when immunizing mice with individual DNA constructs. One week after immunization, specific antibodies to GP3 and GP5 could be detected. Three weeks after the booster immunization, the antibody levels continued to increase and were significantly higher than in the control groups. Neutralizing antibodies were detected two weeks after immunization (usually they can only be detected after three weeks), probably because Quil A enhanced the immune effect of the DNA vaccine. Quil A (Quillaja) is extracted from the evergreen tree Quillaja saponaria as triterpenoid compounds , which activate Th cells, cytotoxic T lymphocytes and B-cells. Quil A improves the immune reaction of an antibody to an antigen; improves the production of antibody subclasses IgG3, IgG2a and IgG2b; and enhances the secretion of IL-2, TNF-β and IFN-γ [37, 38]. Neutralizing antibodies play an important role in the anti-PRRSV response. During PRRSV infection, the induction of neutralizing antibodies indicates that the virus has begun to be cleared from the tissues and blood. Previous studies showed that the GP3 protein of European strains has a neutralizing epitope between amino acids 57 and 73 ; however, the detailed protein structure and function require further study. The data presented here showed that GP3 and GP5 could induce neutralizing antibodies in mice; however, the GP3 neutralizing antibody titer was low. Co-expression of GP3 and GP5 produced a synergistic effect, resulting in a better neutralizing antibody response. The GP5 protein could induce specific neutralizing antibodies and serotype-specific linear epitopes could neutralize viral infections in vitro. A previous study showed that the neutralizing ability of GP5 was higher than that of GP4 and virus neutralization was significantly correlated with GP5 antibody titers . In viral diseases, removal of the virus via cellular immunity plays an important role in the prevention of disease. Cell-mediated immunity (CMI) is also extremely important in PRRSV infection . Previous studies have shown that CMI is significantly related to reduced clinical symptoms in PRRSV-infected pigs . The PRRSV-specific CMI response appears approximately 2–4 weeks after vaccination, as determined by lymphocyte proliferation and interferon γ (IFN-γ) production in a recall reaction [43, 44]. To detect the T cell-mediated immune response, we isolated mouse spleen lymphocytes and performed lymphocyte proliferation transformation experiments in vitro. We found that the experimental group could induce specific T cell proliferative responses after stimulation by a PRRSV LV strain virus-specific antigen. These results also indicated that, in each experimental group, the levels of CD4+ and CD8+ T cells were significantly higher (P <0.05) than those in the PBS and pVAX1 immunized group (P <0.01). In the pVAX1-EU-ORF3-ORF5 immunized group, the levels of CD4+ and CD8+ were higher than those in groups immunized with the single protein DNA vaccines. The percentage of CD4+ T cells in the circulating peripheral blood is directly related to the severity of the disease in an animal. The smaller the proportion of CD4+ T cells, the more likely that the animals will develop a serious infection. CD4+CD8+ immune cells have an important function in antigen recognition. The immune response mediated by Th1 cells could be affected by CD8+ T cells in PRRSV infection [45, 46]. Th1 cells in CD4+ subsets (Th cells) secrete IL-2, IFN-γ, TNF-β and other cytokines. Th1 cells mainly mediate the immune response and play important roles in immune regulation of organ-specific autoimmune diseases, in organ transplant rejection and infection immunity. Th2 cells in CD4+ subsets (Th cells) secrete IL-4, IL-5, IL-6, IL-10, IL-13 and other cytokines. Th2 cells mainly regulate humoral immune responses and play a decisive role in the induction of anaphylaxis. In this study, the assessment of serum cytokines after vaccination revealed that the pVAX1-EU-ORF3-ORF5 groups secreted significantly higher levels of IFN-γ than any other group at 35 dpi. While levels of IL-2 and IFN-γ peaked at 35 dpi, those of IL-4 and IL-10 reached a maximum at 35 dpi in the pVAX1-EU-ORF3-ORF5 group. These results indicated that mice immunized with DNA vaccines were induced to produce both Th1-type and Th2-t cytokines after the booster vaccination. In summary, the DNA vaccines expressing GP3 and GP5 of Genotype-I PRRSV showed good immunogenicity, and the DNA vaccine expressing both GP3 and GP5 produced better results. These data provided a theoretical basis for future experimental studies. In addition, careful selection of adjuvants or delivery systems can enhance prime-boost regimen-elicited immune responses, and new vaccine adjuvants can potentiate immunogenicity and the protective effect of PRRSV vaccines. Consequently, it is essential that future PRRSV vaccines must be more potent, safe, effective, and provide better protection against PRRSV. Furthermore, the involvement of GP3 and GP5 proteins in viral proliferation and viral replication during infection-induced immune responses also requires further research. The Dalian Entry-Exit Inspection And Quarantine Bureau provided the Lelystadstrain of PRRSV (LV, its nucleotide sequence homology with those wild strains in China was 91%-97% [27, 47], which also is the obtainable strain for us). Virus propagation in MARC-145 cells was performed in MEM medium supplemented with 10% fetal bovine serum at 37°C with 5% CO2. The Reed-Muench method  was used to determine the virus titers (expressed as 50% tissue culture infective dose [TCID50] per milliliter) on Marc-145 cells. A Viral RNA Mini Kit (QIAgen Inc., Valencia, CA, USA) was used to extract the viral RNA, according to the manufacturer’s instructions. Reverse transcription using a PrimeScript® RT Master Mix kit (TaKaRa Biotechnology Co. Ltd., Dalian, China) was used for first-strand cDNA synthesis, which were stored at -80°C. PCR was used to amplify ORF3 and ORF5 of PRRSV European type. Two prokaryotic expression plasmids (pET-28a-ORF3 and pGEX-4 T-ORF5), and three eukaryotic expression plasmids (pVAX1-EU-ORF3-ORF5, pVAX1-EU-ORF3 and pVAX1-EU-ORF5) were constructed. The GP5 N-terminal signal peptide sequence affects its expression in prokaryotic expression plasmids; therefore, the DNA sequence encoding the GP5 signal peptide sequence was removed in this study. A sequence encoding a G4S flexible linker was inserted between the ORF3 and ORF5 genes in the eukaryotic expression plasmid pVAX1-EU-ORF3-ORF5. All the primers used in this study are shown in Table 2. Primers P1/P2 were for full-length ORF3; P3/P4 were for ORF5 lacking the signal peptide; primers P5/P6 were for full-length ORF5, primer P7 was for the full-length sequence of ORF5; the italics part encodes the G4S flexible Linker. GP3 and GP5 protein, as structure envelope protein of PRRSV, can hardly be expressed by prokaryotic expression system, in this study, we deleted the signal peptide sequence to obtain GP3 and GP5 protein so as to ensure the expression level. The expression plasmids correctly identified as pET-28a-ORF3 and pGEX-4 T-ORF5 were induced by IPTG, and the expressed proteins were recovered from the bacteria and analyzed by SDS-PAGE. Six 3-month-old male New Zealand white rabbits were immunized with purified GP5 or GP3 protein mixed with an equal volume of Freund’s complete adjuvant. Two weeks later, a booster immunization in Freund’s incomplete adjuvant was administered. A third immunization was performed three weeks later. One week after the third immunization, rabbit sera were analyzed by western blotting. An IFA was used to determine the protein expressions of the European-based DNA vaccines pVAX1-EU-ORF3-ORF5, pVAX1-EU-ORF3 and pVAX1-EU-ORF5 in BHK-21 cells, as previously described . The Research Ethics Committee of Jilin University reviewed and approved all the procedures for handling the mice used in this study. All animal experiemnts were conducted in accordance with the Chinese Laboratory Animal Administration Act 1988. All mice experiments were performed in an ethical and humane manner under veterinary supervision. Sixty 6-week-old female BALB/c mice, weight 18–20 g (Experimental Animal Center, Academy of Military Medical Science of PLA, Beijing), were randomly divided into five groups (12 mice each): the experimental groups were pVAX1-EU-ORF3-ORF5, pVAX1-EU-ORF3 and pVAX1-EU-ORF5; the control groups were pVAX1 and PBS. All mice were maintained and bred in the experimental animal facilities of the Institute of Military Veterinary. Each mouse was injected intramuscularly (IM) with a dose of 100 μg of plasmid DNA, and a booster immunization with same dose was performed after three weeks. The plasmid DNAs were delivered in the form of chitosan-DNA nanoparticles. After completely dissolving 0.2 g chitosan (Sigma-Aldrich, St. Louis, MO, USA) in 200 mL of 1% acetic acid, sodium hydroxide solution was added to adjust the solution to pH 5.5. The chitosan solution was stored at 4°C after sterile filtration through a 0.45 μm membrane filter. Plasmid DNA (100 μg) dissolved in 100 μL of 20 mmol/L sodium sulfate solution with 200 μg Quil A (Accurate Chemical & Scientific Corporation, Westbury, NY, USA) as adjuvant, was mixed with an equal volume of chitosan solution. Following a 30-min incubation in a water bath at 55°C, the solution was rapid mixed by vortexing for 30s, and agarose gel electrophoresis was used to evaluate the uniformity of the coated nanoparticles. Sera from mice in the experimental groups were separated at 0, 7, 14, 21, 28, 35 and 42 days for the detection of specific antibodies and cytokine analysis of peripheral blood. Mice were sacrificed 14 days after the second immunization, and spleen T-lymphocytes were separated and analyzed for T cell subsets (CD3+CD4+ and CD3+CD8+). Purified GP3 and GP5 recombinant proteins were diluted to 2 μg/ml with phosphate buffer (0.01 M, pH7.4) as coating antigen for an indirect ELISA to detect the levels of specific antibodies in sera. The protocol followed a previously published method . Sera from all animals in each immunization group were heat-inactivated for 30 min at 56°C. Serial two-fold dilutions of test sera were incubated for 60 min at 37°C in the presence of 200 TCID50 of the LV strain in DMEM containing 2% FBS. The mixtures were added to 96-well microtiter plates (Costar, Corning, Tewksbury, MA, USA) containing confluent MARC-145 cells (2 × 105 cells,) that had been seeded 48 h earlier. After incubation for 5 days at 37°C in a humidified atmosphere containing 5% CO2, the cells were examined for cytopathic effects (CPEs). Meanwhile, positive and negative controls, virus regression tests, serum toxicity controls and normal cell controls were performed. Finally, according to the Spearman-Karber method, the dilution of serum that contained a neutralizing antibody titer that could protect 50% of cell from the CPE was calculated. An ELISA kit (ELISA Ready-SET-Go!®, eBioscience, San Diego, CA, USA) detected serum IL-2, IL-4, IL-10 and IFN-γ, according to the manufacturer’s instructions. Centrifugation with Ficoll-Hypaque lymphocyte isolation solution (TBD Science, China) was used to isolate splenocytes of immunized mice, according to the manufacturer’s instructions. To assess the proliferative response of T lymphocytes against LV-specific antigens, lymphocytes in RPMI 1640 were adjusted to 2 × 106 cells/mL and 50 μL of lymphocytes (1 × 105 cells) were added to wells of a 96 well plate. The control wells included a non-specific stimulant (ConA, 5 μg/mL, Sigma), 50 μL/well; a specific stimulant (PRRSV LV virus: normally, LV strain does not infect murine cells; T lymphocyte proliferation response approach is not through virus infection but use the virus as antigen stimulation to lead transform and proliferation of sensitized lymphocyte. In addition, purified virus as antigen stimulation will be more close to the native conformation of virus protein) 50 μL/well (1MOI); and no stimulation control cells (RPMI-1640), 50 μL/well. Each sample included three repetition wells. The 96-well cell culture plate was incubated in a 5% CO2 incubator at 37°C for about 72 h, and then 10 μl (5 mg/mL) WST-1 (Beyotime Institute of Biotechnology, Haimen, China) solution was added to each well, before incubating for 3–5 h in a 5% CO2 incubator at 37°C. An ELISA microplate reader measured the absorbance at 450 nm. The proliferation of splenocytes was represented by the stimulation index (SI): SI = mean absorbance value at A450 of stimulated cells divided by the mean absorbance value at A450 of the negative control. Mouse spleen lymphocytes (1 × 106) were transferred into a 1.5 mL centrifuge tube. One milliliter of a fluorescent solution (100 mL 0.15 M PBS pH7.4, 2%NBS) was added, and the tube was centrifuged at 1500 rpm for 3 to 5 minutes. The supernatant was removed, and the pellet was resuspended in 300 μL of cell fluorescence solution. PE anti-mouse CD8, PE/Cy5 anti-mouse CD3, FITC anti-mouse CD4 (BioLegend, CA, USA) fluorescent antibodies were added and thoroughly mixed before being placed in the dark at 4°C for 30 minutes. After washing twice with fluorescent solution and centrifuging at 1500 rpm for 5 minutes, the supernatant was discarded. The cell pellet was resuspended in 500 μL of fluorescent preservation solution (0.15 M PBS pH 7.4, 2% Glucose, 1% Formaldehyde, 0.1%NaN3). Flow cytometry was then used to count CD3+CD4+ and CD3+CD8+ T lymphocytes among 10,000 cells. Statistical analysis of the percentage of CD3+CD4+ and CD3+CD8+ T lymphocytes was then performed. All data are presented as mean ± S.D. The differences in the level of humoral and cellular immune responses between different groups were determined by One-way repeated measurement ANOVA and Least significance difference (LSD). Differences were considered statistically significant when P < 0.05. Submitting author, Jing-Qiang Ren, E-mail: rjq207@163.com; Address: Institute of Military Veterinary, No. 666 west liuying Road, Jingyue District, Changchun City, Jilin Prov. China 130122. We thank Li Ping and Hu NingNing for their assistance in cell culture and reagent preparation. This work was supported by grants from the National High Technology Research and Development Program of China (863 Project) (No. 2011AA10A208) and the Jilin Provincial Department of Science and Technology (No. 20090235). JQR performed most of the experimental work and drafted the manuscript. WCS, SBW and JJ participated in the analysis of humoral and cellular responses. FLY, HL, CXL, PPX, XC and SWD participated in the immunization of mice. NYJ and HJL revised the manuscript for important intellectual content and gave final approval of the version to be published. All authors read and approved the final manuscript.